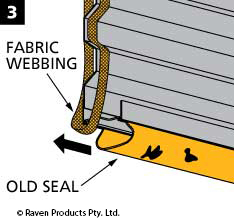 Replacement Roller-Door Seal is suitable for B&D roll-up doors made before 1997. RP143 Replacement Roller-Door seal for B&D doors made before 1997. 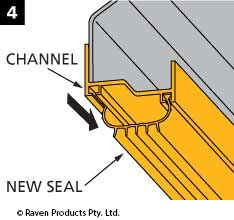 For a close fit, RP143 should be similar to your existing seal so it can slide in channel and hold firm. 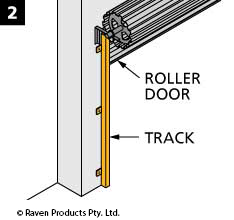 IMPORTANT: Before opening pack, compare your existing B&D roller-door seal to the RP143 profile. Push the roller-door up. For automatic doors, unplug the electric power to the motor first. Unbolt and remove the track opposite the motor to access old seal. Temporarily move the fabric webbing out of the way. Pull out the old seal. Slide the new seal into the channel and trim to suit. Position the fabric webbing back into place. Bolt the track back into place.